Lyft, the ride-hailing company, sold its shares to the public for the first time, heralding a march of the "unicorns". 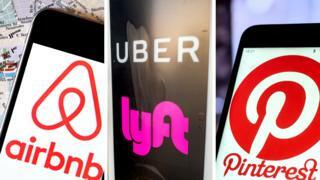 A stream of these businesses - which are defined as private, venture capital-backed firms worth over $1bn - are set to follow, including Lyft's rival Uber, online scrapbook company Pinterest and home-sharing site AirBnB. For Lyft, its shares listed on the Nasdaq stock exchange at $72 each, giving it a market value of just over $24bn - more than five times the size of, say, British High Street stalwart Marks & Spencer. But unlike M&S, which has been around for well over a century, Lyft is only seven years old - and it is yet to make a profit. "I did a lot of research on private venture capital backed companies," said Ilya Strebulaev, professor of finance at Stanford University. "We find that on average the unicorns are overvalued by about 50%." It says that in the US alone, households spend over $1.2 trillion a year on personal transportation. That's the prize Lyft is going after. Rett Wallace, founder and chief executive of Triton Research, said there is merit in Lyft's business model. "The idea that you don't have to have a car that you don't use 95% of the time, and maintain, and insure and garage… transportation could be performed better than what Detroit has given us." Tom White, senior research analyst at DA Davidson, says: "There isn't a ton of evidence yet that it's happening on any broad scale." But broad vehicle ownership data "indicates that it's not really having much of a massive impact yet". Then there are Lyft's losses. Prof Strebulaev said that typically venture capital-backed businesses make losses "because they basically sacrifice profits to achieve very high growth or scale". But "the question really for everybody and for investors," he said, "is whether Lyft and Uber's business model will allow them to convert these very substantial losses into profits at some point... and whether the market will sustain those losses." Mr Wallace said: "We had a small taste of what a dotcom crash looks like in the Snap story." "A lot of investors lost money with Snap," he said. "We have a flavour of what it looks like for investors to rush into these things and get killed." "These companies are a lot larger and more established in a lot of ways," he said. "They've been able to amass massive amounts of private capital and stay private for longer and achieve a size and scale that was pretty rare for a company that was about to go public the last time around." Prof Strebulaev said: "In the previous cycle, the business models were more about promise of the future and the promise of the future revenues. "Many companies today do have those revenues. It is now about a promise of future profitability which is very different." Among Lyft's plans for the $2.3bn it is raising from its IPO, are to invest in acquisitions and technology. It is working with Irish firm Aptiv to trial self-driving cars in Las Vegas, where it has completed thousands of journeys. It is also developing its own autonomous vehicle system at its "Level 5" engineering centre. And Mr White thinks in order for ride-hailing firms to make transport services a cheaper alternative to car ownership, prices will have to fall by maybe 30-40% - a move that would impact Lyft's financials. "If there's going to be a recession then the IPO window might close," he said. "That happened, of course, in 2000 when the IPO window closed, when not a single company could go public." "Can this happen tomorrow? I don't expect so. Can this happen over the next six months? I think it is not unlikely." Mr Wallace said: "I think if I was losing $1bn a year in my company and I could sell it to a bunch of American retail investors, I would be psyched to do that whatever the IPO window is. "Look at the losses - someone has got to pay for these losses." Prof Strebulaev said: "What I believe, and this is not really about Uber and Lyft, but an average unicorn, is that there are 100-plus of them and it is difficult to imagine based on historical evidence and my research that all of them are going to be successful."